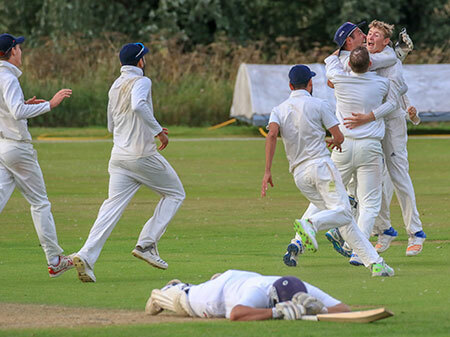 A memorable day for Paisley’s sporting public saw not only St Mirren make a winning return to Scottish football’s top flight but also the town’s leading cricket club move to the brink of clinching the Western Premier title for the first time. Victory over Dumfries at Meikleriggs, coupled with Clydesdale’s defeat to West of Scotland, means Ferguslie, with three games remaining, can only be caught with an improbable sequence of events involving a collapse of Barings Bank proportions. They were at their efficient best in posting 275-6, the league’s top scorer Michael English again in superb form. Indeed, the Scotland prospect looked on course for his third century of the campaign until being run out for 90. Supporting roles were played by Riyaad Henry (49) and Taimoor Ahmad who smashed a rapid 44 with three sixes. Dumfries, battling for survival, kept Ferguslie waiting for their win with a gutsy batting display of their own before falling 59 runs short as Haroon Tahir, Greg Cameron and skipper Jamey Carruthers each claimed two wickets. In contrast to Ferguslie’s joy, defeat leaves Dumfries staring at the prospect of relegation. Second placed Clydesdale needed to win their Glasgow derby at Titwood to have any realistic chance of overhauling Ferguslie but instead went down by five wickets as West secured their top-flight status. Ayr’s relegation woes intensified after a five-wicket defeat against derby rivals Prestwick at the Henry Thow Oval. In a low-scoring affair, Gavin Pitt claimed 4-30 as Ayr were dismissed for 92 before Fazal Jawad’s 41 proved decisive. Skipper Neil Flack top-scored with 46no as Greenock took a big step towards safety with victory at Uddingston. Stirling consolidated their top three place but only after a last-over one-run win against Poloc who had looked on course to successfully chase the home side’s 222 at New Williamfield. MEANWHILE the Eastern Premier continues to be a two-horse race after leaders Grange and reigning champions Heriot’s negotiated their latest tests. At Raeburn Place Grange had half-centuries from Preston Mommsen and Ryan Flannigan as they posted 226-8 against RH Corstorphine. The Grange spinners then went to work, Andrew Brock claiming 4-14 and teenager Charlie Peet 3-7 as the visitors collapsed from 64-3 to 79 all out. Second placed Heriot’s meanwhile made light work of despatching a Glenrothes side who are now certain to be relegated. The Fifers travelled to Goldenacre needing to win all four of their remaining matches to have any chance of staying up but they were bundled out for a paltry 50, off-spinner Ryan Brown doing most damage by taking five wickets while conceding just a single run. Heriot’s took just 12.2 overs to knock off the runs without losing a wicket. Elsewhere Rory Johnston hit his second century of the campaign as Forfarshire enhanced their prospects of finishing third with a 173-run win over Aberdeenshire at Mannofield. The Scotland Performance Academy youngster anchored the innings with 109 from 142 balls including nine boundaries while Callum Garden added a 63-ball 60 as the visitors posted 273-7. After a solid start to their reply, Aberdeenshire capitulated to 100 all out, Brock Ditchmen claiming five wickets for only three runs. Carlton remain just ahead of Forfarshire in the race for third after the Grange Loan side won by an identical margin against relegation-threatened Stewart’s Melville at Inverleith. Watsonians took an important step towards securing top-flight status with a 78-run win at Arbroath.